Severely depleted levels of magnesium (below 800 mg/L) can cause depressed pH levels and an inability to maintain proper magnesium levels. The most frequent causes of magnesium deficiency are use of kalkwasser, frequent overdosing of a carbonate additive, or low levels in the salt mix itself. Kalkwasser, for instance, precipitates magnesium as magnesium hydroxide while excess carbonates precipitate it as magnesium carbonate. In both cases, this means that magnesium that was present in the water is now unavailable. Of the two, magnesium hydroxide and magnesium carbonate, the former is more problematic; it is extremely insoluble. Once magnesium has precipitated as magnesium hydroxide, it will never redissolve. Magnesium carbonate will redissolve; however, it does so slowly. So, while it will go back into solution, there will be a significant portion of time in which magnesium levels are depleted.Reef Advantage Magnesium™ is a concentrated (80,000 ppm) optimized blend of magnesium, chloride, and sulfate salts designed to restore depleted levels of magnesium with minimal impact to the ionic ratios found in natural sea water. Reef Advantage Magnesium™ contains no ammonia. This is a common contaminant in every liquid magnesium supplement on the market. 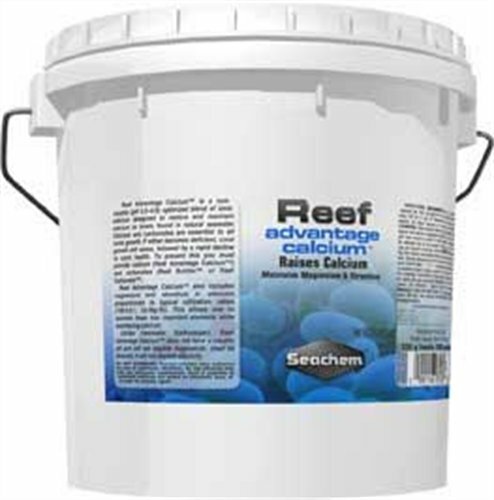 Sachem Reef Advantage Calcium is equivalent to dry Reef Complete. It is a non-caustic (pH 8.3-8.6) optimized blend of ionic calcium designed to restore and maintain calcium to levels found in natural seawater. Calcium and carbonates are essential to all coral growth. If either becomes deficient, coral growth will cease, followed by a rapid decline in coral health. Reef Advantage Calcium also includes magnesium and strontium in amounts proportionate to typical utilization ratios. This allows one to maintain these two important elements while maintaining calcium. If either usage or precipitative loss results in a more rapid loss of either magnesium or strontium, then Reef Advantage Magnesium, Reef Advantage Strontium, or Reef Strontium. may be employed. Unlike limewater (kalkwasser), Reef Advantage Calcium does not have a caustic pH and will not deplete magnesium. Used as directed, it will not deplete alkalinity. Reef Advantage Magnesium is a concentrated optimized blend of magnesium, chloride, and sulfate salts designed to restore depleted levels of magnesium with minimal impact to the ionic ratios found in natural sea water. Severely depleted levels of magnesium (below 800 mg/L) can cause depressed pH levels and an inability to maintain proper magnesium levels. The most frequent causes of magnesium deficiency are use of kalkwasser, frequent overdosing of a carbonate additive, or low levels in the salt mix itself. Kalkwasser, for instance, precipitates magnesium as magnesium hydroxide while excess carbonates precipitate it as magnesium carbonate. In both cases, this means that magnesium that was present in the water is now unavailable. Of the two, magnesium hydroxide and magnesium carbonate, the former is more problematic; it is extremely insoluble. Once magnesium has precipitated as magnesium hydroxide, it will never redissolve. Magnesium carbonate will redissolve; however, it does so slowly. So, while it will go back into solution, there will be a significant portion of time in which magnesium levels are depleted. 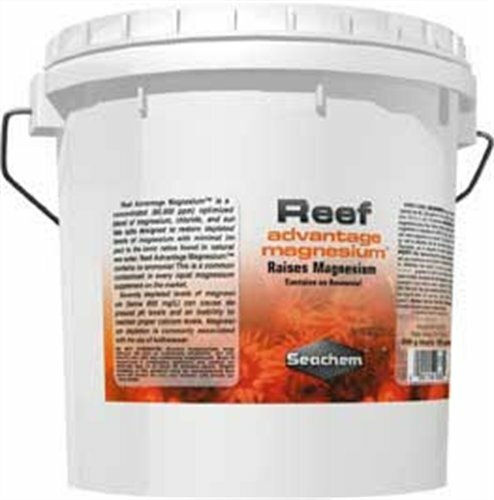 Reef Advantage MagnesiumTM is a concentrated (80,000 ppm) optimized blend of magnesium, chloride, and sulfate salts designed to restore depleted levels of magnesium with minimal impact to the ionic ratios found in natural sea water. Reef Advantage MagnesiumTM contains no ammonia. This is a common contaminant in every liquid magnesium supplement on the market. 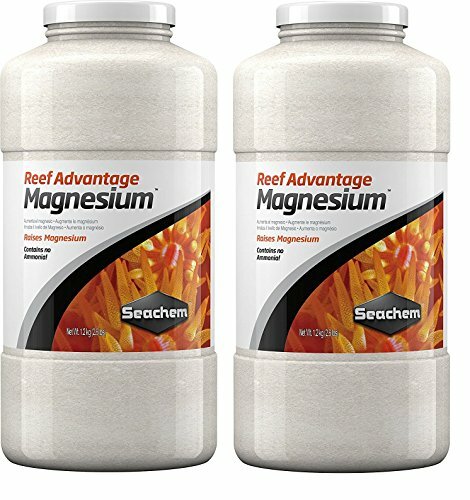 Copyright © Wholesalion.com 2019 - The Best Prices On Seachem Reef Advantage Magnesium Online.